Future is always complex. Predicting future is fraught with danger. Chances of getting future wrong are bright. However future is always built on contexts that are current. Future is always shaped by the challenges faced in present. There is a lot happening in our world at this time. Technology is progressing at a pace that is hard to keep track of. Just for example in last three years the mobile penetration has doubled, homes with digital TV subscription have gone up exponentially; the FM stations have moved from metros to class one and class two towns. The changes are not just tech driven. The demographic changes are re-crafting the entire society. The rapid urbanization is throwing up challenges not faced before. There are no indicators suggesting that the speed of change will slow down or the transformation is eased off. Here are three challenges that we are likely to face in coming years. First is the challenge of nomadic audiences. Second the challenge of contexts. Last is the challenge of measurement. Let’s take this rise of portable personal media and the possible stagnation of traditional mass media forward. 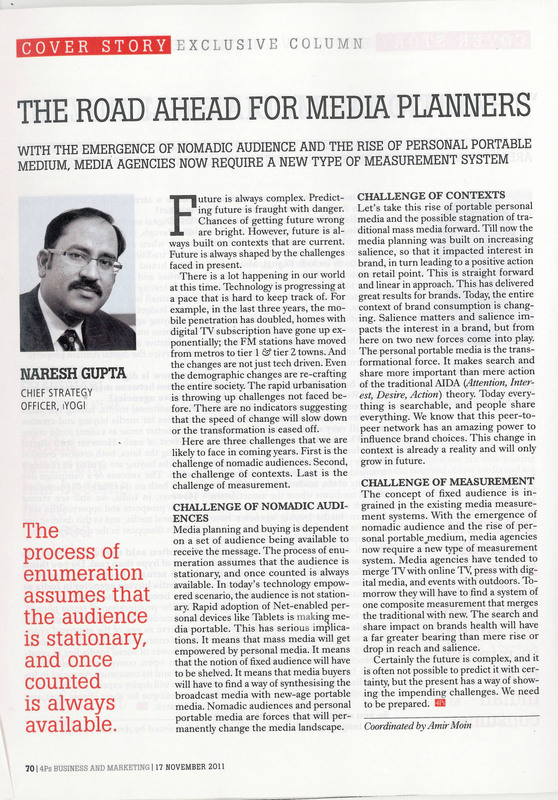 Till now the media planning was built on increasing salience, so that it impacted interest in brand so that it lead to positive action on retail point. This is straight forward and linear in approach. This has delivered great results for brands. Today, the entire context of brand consumption is changing. Salience matters and salience impacts the interest in a brand, but from here on two new forces comes into play. The personal portable media is the transformational force. It makes Search and Share more important than mere Action of the traditional AIDA theory. Today everything is searchable, and people share everything. We know that this peer to peer network has an amazing power to influence brand choices. This change in context is already a reality and will only grow in future. This entry was posted in Advertising, Branding, India, Social Media and tagged Advertising, Brand Strategy, Communication, Consumer Behavior, Insights, Social Media, Strategy by nareshgooglegupta. Bookmark the permalink. Absolutely in agreement, from here on the challenge will be to handle the ever growing fragmentation, TV space and time fragmentation, viewer attitude and attention fragmentation. The confluence of emerging technology and growing consumer demand for choice and control is changing the ecosystem. Like with television likely to be increasingly viewed across multiple platforms, there is obviously a requirement to measure audiences for each of the platforms available. Also, the methodology available today can accurately measure mass broadcasting or large audiences; however, for programs attracting smaller audiences, sample sizes often present limitations even now. This will become an even bigger issue as audience narrowcasting and niche programming grows.